The market’s rally from a low point on Christmas Eve last year has given a lot of investors reason to think that the worst of the correction before that, which tested bear market territory for all of the major market indices, is probably done. With seemingly positive news on the trade front working along with an increasingly accommodative Federal Reserve attitude about interest rates moving forward giving investors hope for the immediate future, it seems like nearly every sector and industry of the market has rallied quite nicely so far this year. One industry that has seen an impressive run from pre-Christmas lows is Pharmaceuticals, which has increased nearly 10% year-to-date based on the US Pharmaceuticals iShares ETF (IHE), and a little over 17% from late 2018. For some investors, Pharmaceutical stocks are seen as being pretty risky because stock prices in this industry can be pretty volatile, with very wide swings from high to low. Perrigo PLC (PRGO) is a good example of what I’m talking about; from February 2015 until the beginning of April of that year, the stock jumped more than $50 per share from about $150 to nearly $205 per share. As impressive as that more than 30%, two-month increase was, the stock’s decline from that high has been even more so; but the beginning of 2016 the stock had dropped back to about $140 per share, to around $70 by the beginning of 2017, and then to a new multi-year low around $36 in December of last year. If you’re one of the people that bought the stock around $200, or just about at any point before the last few months of 2018, you’re certainly feeling the pain of that decline. For a value-oriented investor, however, that big decline is something that should make those looking for opportunities to take a new position curious at the very least. The fact that the stock has rallied from that low point to a new current price at around $50 – about 30% above that low so far this year – adds fuel to the idea the stock could finally be in a position to reverse that long-term downward trend. As always, though, the real question is whether the stock’s fundamentals are really strong enough to make that a realistic possibility, or is it smarter to read the stock’s long-term downward trend as a clear sign to leave the stock alone? PRGO Is an interesting company; they’ve been around since 1887, and were founded in Michigan, but in 2013 moved their legal corporate headquarters to Ireland for tax purposes, a classic example of the kind of expatriation that gave the Trump administration fuel to push through tax reform at the end of 2017. This is a company that still derives about 70% of its revenues from the United States, which to me means despite their legal base in Europe, PRGO is still about as American as they’ve ever been. PRGO operates in an interesting segment of the pharmaceutical industry, generic OTC consumer goods and specialty pharmaceutical products. If you’ve bought a store-brand generic pain reliever at Wal-Mart, Kroger, or Target stores, for example, there’s a great chance you bought one of their products. In a healthy economy, some analysts think that demand for generics is reduced as consumers have a psychological preference for name brand OTC products, and I think there may be some truth to that idea. If you follow that logic, however, and think that the economy could be nearing a turning point and actually move lower, generic producers like PRGO should make more sense, as consumers look to tighten their wallets and become more likely to use generics as a cost-efficient alternative to more expensive store brands. Is the stock a good value that you should pay attention to? I think it could be; take a look for yourself. Perrigo Company PLC (Perrigo), formerly Perrigo Company Limited, is an over-the-counter (OTC) consumer goods and specialty pharmaceutical company. The Company’s segments include Consumer Healthcare (CHC), Branded Consumer Healthcare (BCH), Prescription Pharmaceuticals (Rx) and Specialty Sciences. It manufactures OTC healthcare products and supplies infant formulas for the store brand market. It is also a provider of generic extended topical prescription products. The CHC segment is focused on the sale of OTC store brand products. The BCH segment develops, manufactures, markets and distributes various European OTC brands. The Rx segment develops, manufactures and markets a portfolio of generic and specialty pharmaceutical prescription drugs. The Specialty Sciences segment consists of assets focused on the treatment of multiple sclerosis, specifically in connection with the drug, Tysabri. PRGO has a current market cap of about $6.9 billion. Earnings and Sales Growth: Over the last twelve months, earnings declined by -24%, while revenue also declined, by about -7%. In the last quarter, earnings declined about -11% while sales actually increased by about 5.5%. The company’s margin profile shows signs of strengthening as well; Net Income was a very narrow 2.76% of Revenues in the last twelve months, but improved to nearly 7% in the last quarter. That’s still pretty tight, but it does look like a good indication that the company is doing a good job at improving their bottom line. Free Cash Flow: Over the last twelve months, PRGO had $490.4 million in Free Cash Flow. That’s adequate, if not very remarkable, and translates to a Free Cash Flow Yield of a little over 7%. It’s also worth noting that Free Cash Flow declined from about $600 in mid-2018 to its current level, a notion which refutes the idea the stock’s improving Net Income suggests, that operational efficiency is improving. Debt/Equity: PRGO’s debt to equity ratio is .54, which is a generally conservative number. Their balance sheet shows a little over $551 million in cash and liquid assets against about $3 billion in long-term debt; however I don’t see any indications servicing their debt might be a problem. Dividend: PRGO’s dividend is $.76 per share and translates to a modest annual yield of 1.5% at the stock’s current price. Price/Book Ratio: there are a lot of ways to measure how much a stock should be worth; but one of the simplest methods that I like uses the stock’s Book Value, which for PRGO is $41.72 and translates to a Price/Book ratio of 1.20 at the stock’s current price. The stock’s historical average Price/Book ratio is 1.78, meaning that the stock is currently sitting about 47% below that average. That puts a long-term target price for the stock at about $74 per share. The stock is also trading about 95% below its historical Price/Cash Flow average. I think forecasting a target price at nearly $100 might be a big over-optimistic over the next couple of years; among the risk the company is dealing with right now is a case brought by the Irish government alleging a $1.9 billion discrepancy in taxes paid in 2013 when the company expatriated to that country. The company is aggressively disputing the case, which means that any resolution is likely a year or more away. Current Price Action/Trends and Pivots: The red diagonal line measures the length of the stock’s downward trend from around $96 beginning in February of 2018, until the end of December when it bottomed around $36; it also informs the Fibonacci trend retracement lines shown on the right side of the chart. The stock has rallied about 30% from that low point. Since that low, and into the end of February, the stock rallied to about $50, with the stock consolidating through all of last month between $50 on the high end and support at around $45 per share. The stock currently looks poised to push above that resistance; if it can hold above $51, the stock should see good short-term momentum to test the 38.2% retracement line at around $59 per share. 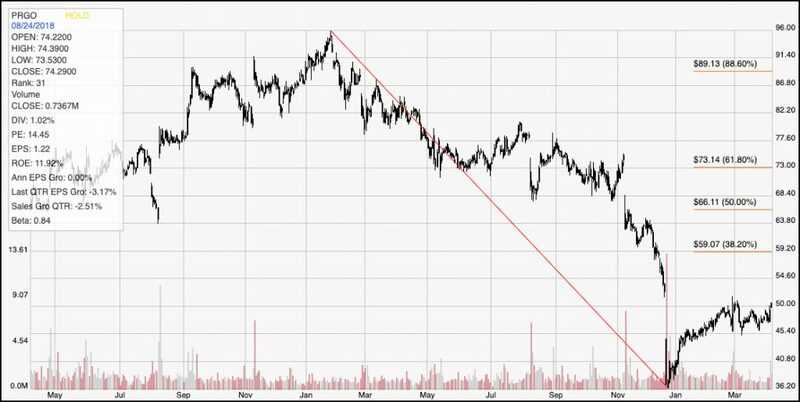 A break below support could see the stock retest its trend and multi-year low at $36 per share. Near-term Keys: From a value-oriented standpoint, I think there is quite a bit about the company that is pretty interesting, with a value proposition that is pretty compelling. In the long-term, I tend to lean more to the idea of generics as a useful low-cost alternative for smart consumers, which I think should help the company keep improving its financial results in the quarters ahead. If you prefer to look for a short-term oriented trade, a break to $51 could mark a good signal to place a bullish, momentum-based trade using call options or just buying the stock outright, with a near-term target around $59. If, however the stock breaks below $45, you might think about using that drop as a signal to short the stock, or start buying put options with an eye on the stock’s low around $36 as a target for a bearish trade.